Kami’s character is a teen genius aiming for MIT. She doesn’t relate to people and often gives them nicknames of her own devising. For her science project she gathers scraps of meaningful pieces of her life (concert tickets, letters) and stuffs them in her locker with a color coded marble for her “chaos theory” experiment. Everyday she opens her locker she literally waits for another ball to drop. One small change can significantly effect the future (think Butterfly Effect) and Kami struggles to grasp how she can define that in just a locker. Enter: Daniel. He’s known around school as the boy who killed his sister with drugs. When Kami accidentally gets involved with him, something just doesn’t add up in her logical mind and she can’t let go of the mystery behind the boy. Sandy is Kami’s best friend, probably the only one who knows and understands every side of her. Sandy’s theatre work and gossip network makes her a more than competent part of the team. Sam is Sandy’s boyfriend and a reporter for the newspaper. His inquisitive nature and sleuthing skills of his own help him join in the ranks. But (thank goodness) this isn’t a story about teenagers trying to take down drug dealers on their own. Kami’s little group work with Daniel’s handler, Detective Bob, to figure out the truth behind Julia’s death and the drugs found with her. 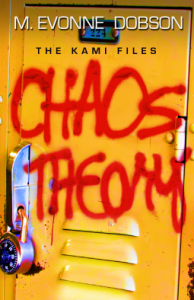 As the story moves on the chaos theory experiment becomes less about the locker and expands into the real world as Kami herself is gaining more knowledge of people as humans and not just data points. The group learns how each small and seemingly unimportant change in Julia’s life ultimately contributed to the end. Overall, I suggest this book to anyone who likes young adult mystery/crime novels with a small mixture of romance. I’m most defiantly waiting for another Kami File.